Once again, congratulation to our Brunei runner. 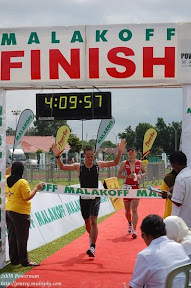 Sefli Anak Ahar has managed to finished in a time of 2:52:21 and rank 25 out of 35 GROE runners. Overall Brunei rank has moved up one place from 30th to 29th. The fastest time was by John Ekiru Kelai with a time of 2:12:22.